We were all waiting and finally the news is now official. After numerous rumors and leaks, the Nexus 6 has reached the market. Or it’s close. Surprisingly, this time Google has unveiled a device before we can actually buy it. 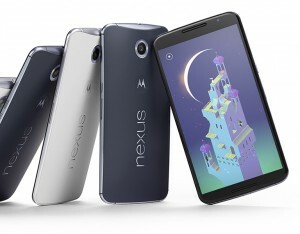 The company has announced that the Nexus 6 will be available for pre-order by the end of the month. So we still need to wait a bit longer to get our hands on it. With this device, Google has changed considerably the policy adopted with the Nexus 4 and 5, where high-end devices were offered at a price significantly lower than the other companies. However, the Nexus 6 is a high-end smartphone equipped with the best technical components, and this is reflected on the price. While previous Nexus remained in the range of $300 – $400, the starting price of the Nexus 6 surpass the $600. However, this device doesn’t seem designed to replace the Nexus 5, but clearly points to a different audience. With its 6-inch screen, Google enters the market of high-end phablets with this terminal. Let’s see in detail its specifications. The Nexus 6 has an AMOLED screen with a size of almost 6 inches (5.96 to be exact), and a resolution of 1440 x 2560 pixels (providing a density of 493 ppi). The Nexus 6 includes a quad-core Qualcomm Snapdragon 805 processor, running at 2.7 GHz. It also packs an Adreno 420 GPU and 3GB of RAM. There are two models available, one with 32GB of internal memory and another one with 64 GB, both without support for microSD cards. To power the device, Motorola has mounted a 3220 mAh battery, which in principle seems enough to go through a full day of use. The Nexus 6 will run the new Android version, officially named Android Lollipop. The rear camera contains a 13 MP sensor with OIS (Optical Image Stabilization), while the front one has a 2 MP one. We have to see the quality that this camera is able to offer, as this has been one of the most criticized points of the previous Nexus models. The Nexus 6 has 4G, Bluetooth 4.0 Low Energy, Wi-Fi and NFC connectivity. In addition, Google offers two versions, one for North America and one for the rest of the world, depending on the bands used by telephone companies in the different areas. The Nexus 6 will be available for pre-order by the end of October. The price is $649 for the 32GB model and $699 for the 64GB model, and it will be available in two colors: midnight blue and white cloud. It will be sold at the Play Store and at the of Motorola’s website, and it will appear in retail store by November. In North America, the Nexus 6 will be available at the major carriers: AT&T, Sprint, T-Mobile, Verizon Wireless, and US Cellular.